So, here is my very first tutorial. Sophie dreamed this block for our January lotto. Her instructions are here. I simply modified her dream to suit me. • 3 pieces of background fabric at least 10” tall and the 3 pieces when laid side by side should be roughly 10” long. 1. Start by laying out the background and 2 of the strips as shown. Put the thinnest background piece in the center, with the wide pieces on the outside. 2. 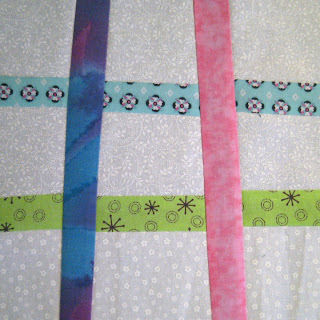 Sew the center background piece to the strips, pressing seam allowance toward the strips. 3. Sew the outside pieces to the strips as shown, pressing seam allowance toward the strips. 4. Trim! I like to trim the block down to 10” wide at this point. Save the end pieces to use in another block. 5. Now, turn the block so the lines are horizontal. Make a vertical cut, as wonky as you like, roughly near the center. 6. Insert a strip, pressing toward the strip. 7. Now, you can make the last cut. Make sure you leave at least an inch between the two strips, so there is still visible background. 8. Insert the last strip, pressing toward the strip. Now to clean it up! I need an 8 ½” block. I trim the edge with the least amount of wiggle room first, and the trim the other edges. I found that by making one cut at a time I was better able to visualize the finished block. Like I mentioned before, this is the first time I’ve tried to write instructions for anything, so please let me know if anything isn’t clear.